A Swiss slaughterhouse was shut down this week after more than 130 antispeciesist activists entered the facility and sat on the kill line. 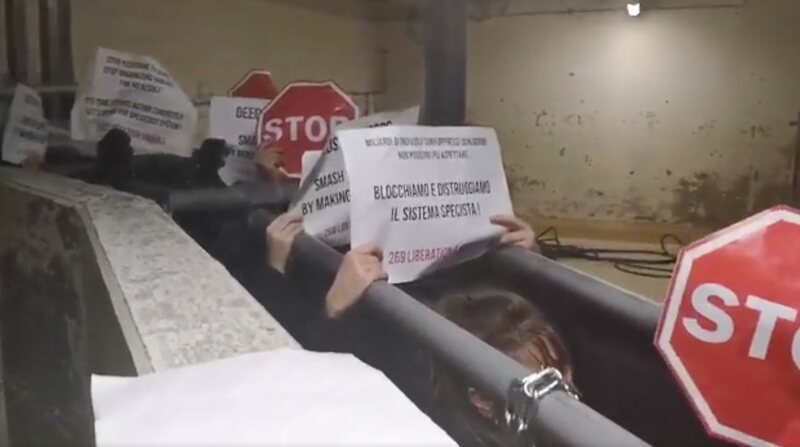 The activists, mainly from France and Belgium, with organization 269 Libération Animale, entered the Bell abattoir at around 2.20 in the morning on November 20. Later that morning, 70 employees were sent home from the plant - which belongs to one of Europe's largest meat processors - as they were unable to work in the section occupied by the campaigners. Police were brought in to remove the activists, some of whom had chained themselves in place, and had to be released with a bolt cutter. According to a police press release, police stepped down their operation at 8pm, after the situation had escalated in the early evening. "For a long time, the deployment was orderly," said a police spokesperson. "There were only a few incidents, some individuals were slightly injured." Writing about the action, 269 Libération Animale said: "Torsion of limbs, police forcing their whole bodies on the individuals on the ground, strangulation and suffocation...the police deploy all their violent repertoire against activists who are attached and prevented from defending themselves! "The dogma of non-violence reduces us to powerlessness and those who accuse us of being 'radical' are complicit in this state violence. Support these activists, denounce what the police are doing to us. "No slaughter, no casualties today in one of the largest slaughterhouses in Switzerland thanks to direct action and co-resistance."